Today, Governor Rick Scott announced a $90 million state commitment for the bridging of a 2.6 mile segment of Tamiami Trail road in South Florida. The project would deconstruct a section of the berm that Tamiami Trail road is currently built on, and replace it with a bridge so that water north of the road could flow into the Everglades, providing needed water to the Everglades National Park. The end effect would be to keep more high nutrient water from entering the Caloosahatchee and St. Lucie Estuaries. Today’s setup of the Tamiami Trail inhibits water flow, which forces more storm water runoff to drain from Lake Okeechobee into the Caloosahatchee and St. Lucie estuaries, instead of flowing South through the Everglades. 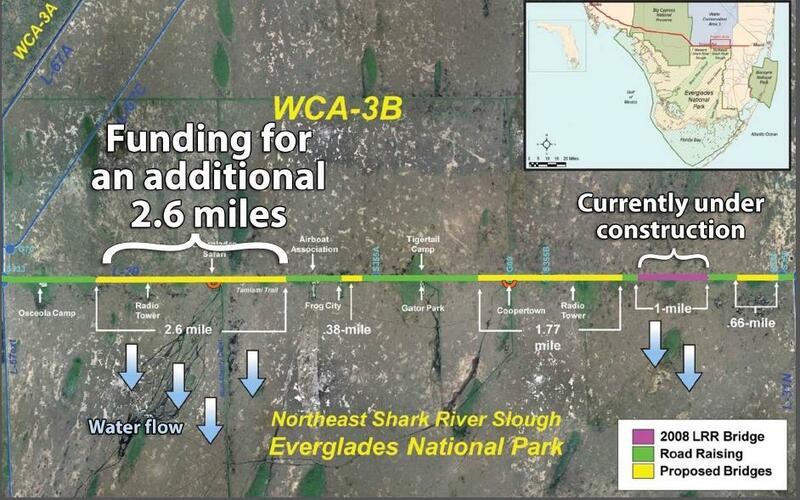 By constructing an additional bridge, more water will be able to flow naturally through the Everglades, which will keep nutrient rich water out of the estuaries. The total cost of 2.6 miles of bridging is estimated to be $180 million. The State of Florida will make a commitment to match federal funds for this project, up to $30 million/year over three years or $90 million total from the Florida Department of Transportation (FDOT) work plan. One of the most critical components of Everglades restoration is increasing water flow under Tamiami Trail into Everglades National Park. ·Providing water managers flexibility in addressing Lake Okeechobee seasonal high water levels. Senator Lizbeth Benacquisto, “I want to applaud Governor Scott for focusing on the things that are important to Southwest Floridians. This commitment is a great step towards improving the water issues that face the Caloosahatchee River and the State as a whole. By raising Tamiami Trail we will be able to remove the constraints on water that is moving south. The SFWMD is taking emergency action to store excess water on public and private lands and this fall the SFWMD will begin work on a $16 million project at Lake Hicpochee, to help control flows into the Caloosahatchee. In addition, the Governor’s Florida Families First budget invested $3 million to create an innovative wetland treatment system in Hendry County that cleans water flowing through the Caloosahatchee River.